This installation made of PVC foil and small light-emitting diodes explores space as an experimental media architecture. Each of the eight foil builds a transparent display with its 35 dots. A great deal of abstraction is required before one can recognize, what is displayed on the screen. 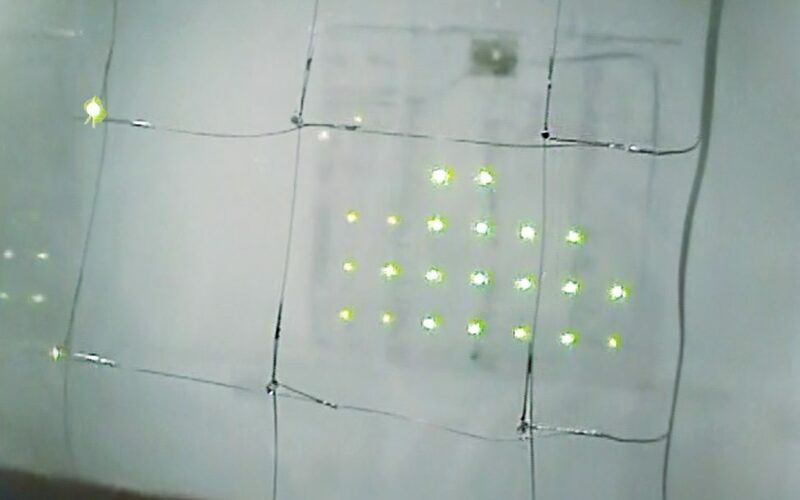 An abstraction capability, which makes it possible to see a display in this unusual structure of foil, cabling, microcontrollers and light-emitting diodes. The view of the screen is gets a new quality: the present of the screen itself – even in the switched off state – becomes a sensory experience. The aim of “Living in a Box” is to create a unique medium from scratch and at the same time to question its dialectic. What is conveyed by the medium? In this case it is not only a minimal computer game, as usual in the center of the consideration. In his c but is brought into harmony with the technical apparatus. In this case, the technical equipment is brought into accordance with the medial content.